Well, I was sitting down to paint, yesterday, when five other kids rampaged into the house along with Jet and my recycle pile disappeared in a flurry of grabs. 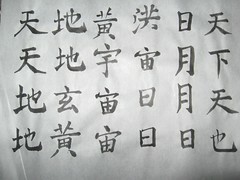 Even my junk calligraphy sheets were snatched up and I was like... what? And the kids liked one of my throwaways so much I had to take a shot of it... and the other one made my neighbor come all the way up to the office and demand that I paint one of them for him, that didn't have the wrinkles... *laughs* And I asked him, "Do you want the three wings, too, on the top swallow?" He had the grace to blush. And, directly from a kid demand, "BIRDS! In a tree not just a stick!!" Okay... *after* the requests for kitty or a monkey or a dragon and a castle and... ahem. I don't like the front bird, at all, still... it's proportions are still off. 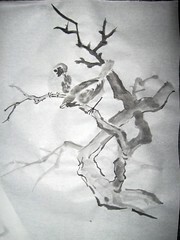 Referenced Chow Chian-Chiu and Chow Leung Chen-Ying's painting with three birds rather than two (I did the two and was so scared of messing up the third I just went for the branches after the birds) in Easy Ways to do Chinese Painting, published by Walter T. Foster. The bottom one, the wings are just a little crooked, and the way it's leaning is very familiar to me after looking out the window a lot! Yeah, that's exactly the problem with the bottom one, the wings are just off. *sighs* But cool that the attitude of it is familiar! Yay! And, yeah, I liked all the colors... and still am all grumpy about not getting the wings balanced. *laughs* yeah! that's it! mid-fluff!! Oh, that is such a cute panda! It's amazing how few strokes it took, and all the kids are like, "Jet's mom is a Chinese artist!!!" I just fell over laughing. *grin* such fun drawing for kids! 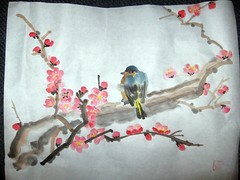 Painting on that rice paper takes a lot of discipline I'm sure but the result is lovely. It is! They were like Oooo! Ahhh! 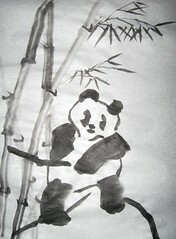 as the panda appeared with single strokes for each ear, eye, nose, mouth, and limbs. *laughs* I think that's the fun part about painting on rice paper, it can be really fast, too, and the kids really liked that, too. Macy has the 'eye' for recreating certain types of art, too. It's fun to watch her, even at just six, getting special art classes, and really getting encouraged to try lots of stuff. I suspect that if I get a brush into her hand, she could do her own pandas pretty quickly. oh the joy you spread around today. remember that, k? It's bewildering... in some sense. Bemusing in others. Thanks about the last painting!! I really do like where I've gotten with trees and branches... I'm getting better and it's fun to see in that last one. I really enjoy looking at your paintings. Keep doing it - I love them! *smiles* I will do so. Thank you, very, very much for the encouragement! Oh! I can see why the kids loved the top one so much! I love the colours in it! *grins* Yeah, the colors are good on that one. *sighs* I finally got a lot of it *dark* enough... and then blew the bird... ah well. More bamboo, yay! :) The panda is adorable, heehee! The painting of the two birds on the branch is lovely, and I can see why you'd want to stop 'just in case'. The proportions aren't perfect but they're not terrible either. They're better than the one in the top pic, so the practice is paying off (boy I hope these are posted chronologically, lol!). Yup, you got it. They were posted chronologically. *laughs* And, yeah, it's better. I need to practice them some more.